I live in El Alto, in the area of ​​Villa Ingenio. I’m an orphan. This project provided me the basic tools and necessary to start a business. 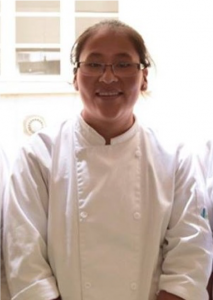 Last year I participated in a contest for entrepreneurs in the city of El Alto and won an award that helped me start up my business idea, which is a bakery. My business now has been running for a couple of months and today I have the possibility of even hiring one of my friends who is also an student of CEFIM. We will produce cakes according to the requirements of my clients. In the future I want to learn more and see that my business is more sustainable and recognized. We are twins, we live in the city of El Alto with our parents and we have a 2 year old little sister. At 15 years old we discovered that we liked baking. Our father encouraged us to undertake something of our own ( have our own business ). Both of us agreed and applied for a CEFIM Scholarship. We learned here to work in teams, we acquired new knowledge in quality production , coordination and communication. We learned to clean the kitchen workshops in detail. 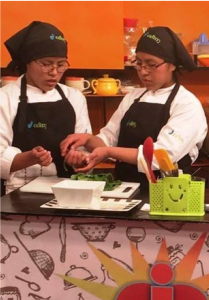 The project gave us the possibility to train and specialize in different types of gourmet cooking, interact with other people and learn about the magic of gastronomy. Our dream is to have a restaurant recognized by the national kitchen of innovation, where we will put into practice everything known and learned through the project. 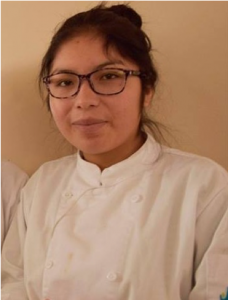 I am 21 years old and I live in the city of La Paz, I am the oldest of my brothers and the one that takes care of all the needs that they have. Since I entered the first day at CEFIM, I felt like family. In the three years that I study at CEFIM, I have met wonderful people who gave me support and helped me when I thought everything was very difficult. The teachers and my classmates encouraged me to discover the best of me. With the CEFIM scholarship, I was able to pay 50% of my studies and my family helped me with the rest. I learned a lot in the commissary, housekeeping and attending events to other institutions. We need your support; still so many others can benefit from Reledev’s projects, like how Beatriz and Coral have. You can help by clicking here and donating to the Reledev cause. A little goes a long, long way.